There is a trend here at Roam With Friends that you might soon pick up on. Let me save you some time and just put it out there: we love camping at state parks. We love the price value, we love the sites, we love the activities, we love the adventure, and we love the choices the state parks give us. With that being said, our stay in a state park is usually short (two to four days). A few years ago, we learned that our state parks system has a rewards program for frequent campers. It is called the Missouri Camper Award. I learned about the award doing one of the things that I do best; reading. Angie and I were sitting together at a picnic table on one of our very early camping trips and I was reading through the brochures the camp host handed us at check-in. Am I the only one who reads those brochures? There in one of the brochures I found a tiny paragraph about earning the camper award. The eligibility for the award looked simple: camp in five different state parks in one year, obtain the camp-host signature, return the form, and earn a patch. Our geek-ness took over and Angie and I decided we wanted the award! The Missouri Camper Award was actually started in 1971 with only 13 recipients. Each year the program has grown to reach nearly 600 recipients in 2011. In addition to the Missouri Camper Award, Missouri also offers a “Distinguished Missouri Camper” award. 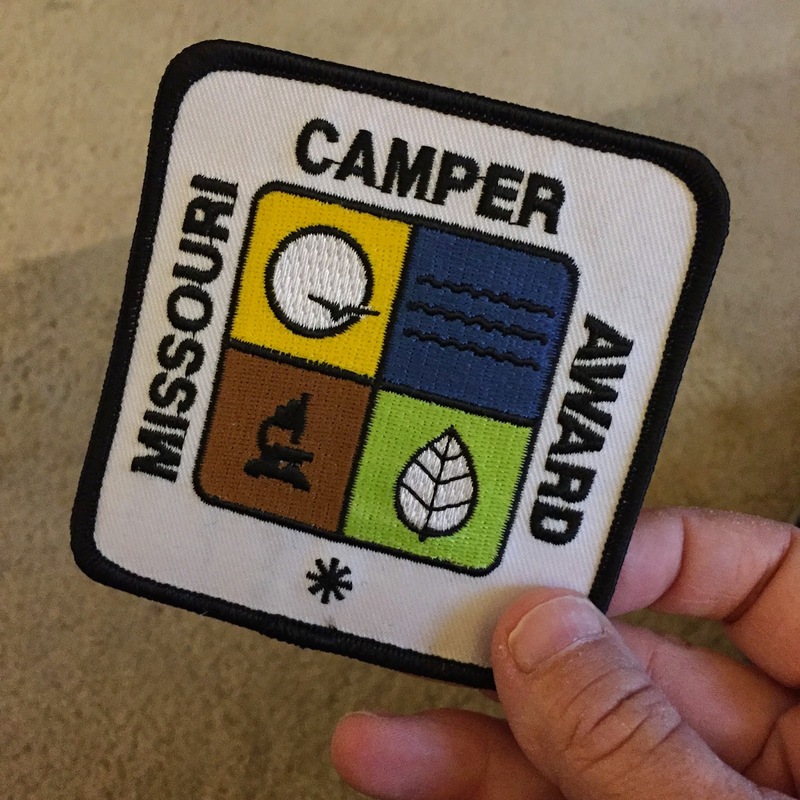 You are eligible for the Distinguished Missouri Camper award for every five years of participating in the Missouri Camper Award. To participate in the program you need a Camper Award form. You can get these directly from Missouri Department of Natural Resources or you can just ask the camp-host at check-in. Every time you visit a new state park you ask the host to certify your form (they date it, sign it, hand it back to you). When you have camped at five different state parks, you mail it in the the Department of Natural Resources. Shortly after that you will receive a package back in the mail. Your package will contain a certificate, a patch and a year bar for each member of your family. After your first year, you will receive a new year bar and a certificate. It is up to you to decide how you want to display your patch. We made a flag for ours that welcomes people to our campsite. We will be working on year number three this summer. We have four trips to state parks lined up and are looking for one more. What about you? Does your state have a rewards program? If so, tell us about it! Interesting. I had no idea the state parks offered this. We just completed our 3rd year this weekend! Putting our card in the mail tomorrow. Your flag idea is great! We might do that too.